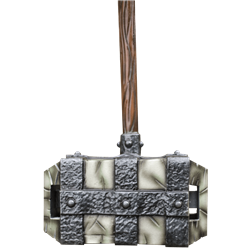 The Iron Banded Stone Hammer is a live action roleplay weapon to be reckoned with. 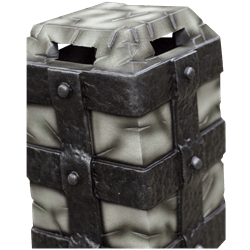 Sculpted and hand painted to look just like a heavy stone encased in dark metal, this elongated warhammer is ideal for crushing enemies, even at a good distance! 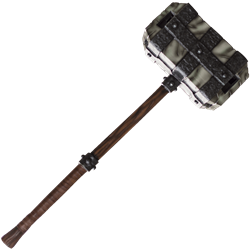 Made of high quality, shred resistant foam, the Stone Hammer is crafted with utmost attention to safety and ease of wielding. The haft features an inner fiberglass core covered in sturdy foam, and the hammer head is hollow and made of latex with an interior foam rod to help it keep its shape. Coated in a layer of resilient latex, this LARP weapons hand painted nature has it looking just like a real medieval weapon, from its metallic details down to its wood-colored haft. Due to its handmade nature, there may be slight variations to its construction. 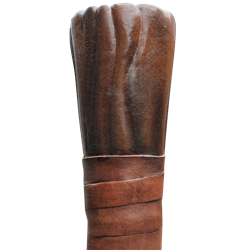 The grip is wrapped in leather for a firm hold and realistic look. 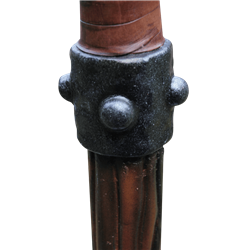 The Iron Banded Stone Hammer is huge, with an overall length of approximately 41 inches and a head that is basically 16 x 8 x 8 inches!